What would Christmas be without a mouth-watering feast? 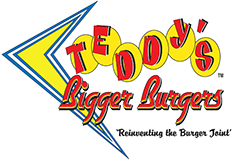 Teddy’s Bigger Burger has just the thing. Announcing our December BOM – Merry Swissmas. This delicious creation is loaded with Swiss cheese, crispy bacon and grilled onions. It’s our gift to you this holiday season so come satisfy those taste buds! The holiday would not be complete without a sweet treat and Christmas favorite– peppermint candy cane. Minty cool freshness in a striped confectionary delight. We have just that – but in a shake called Holiday Mint — mint chocolate chip ice cream blended into a creamy thick shake. Make the season tasty and bright! From all of us at Teddy’s Bigger Burgers — Merry Christmas to you!